Before you make up your mind, let's make sure you looked at all the facts. 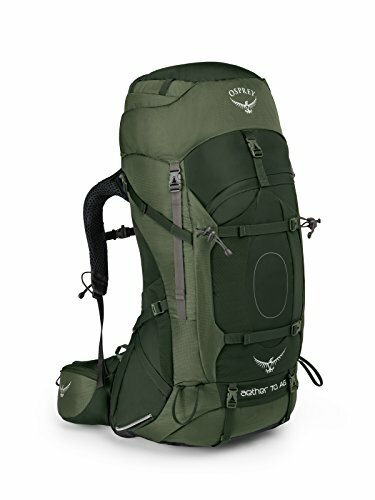 Osprey Atmos AG 65 | from $206.05 is, single handedly, the best backpacking backpack we tested. Flawless comfort is ensured by exceptionally adjustable suspension system that make you even forget you're wearing the pack. Lightweight nature (M Size: 4.6 lbs) and AntiGravity Backpanel Suspension Technology provides incredible ventilation by letting the air flow between your back and the back of the backpack, keeping you very dry along the way. All of these combined with superior tool attachment capability make Osprey Atmos AG 65 very versatile. Upon testing Osprey Atmos AG 50 and 65 and Osprey Aether AG 60, 70 and 85 models, we found that Atmos AG 65 and Aether AG 70 are the best products of their particular series and that's why they're chosen to decide between Osprey Atmos vs Aether. 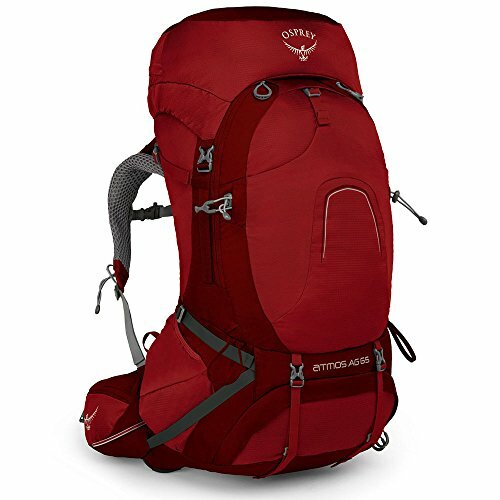 However, Osprey Aether AG 70 | from $289.99 is a superior extended trip (5+ days) pack because its bulkier suspension performs better with very heavy loads only, and zippered front access to the main compartment and convertible top lid daypack (available in US only) features are very useful when carrying plenty of items. We've been buying backpacks online for years and never had any problems. Before you buy, do make sure to check the seller's return policy, but you can almost always return an unused pack within a certain time frame and you're good. If it doesn't fit quite right after trying it on at home, you can always return! This product is a Crunch Top Pick! 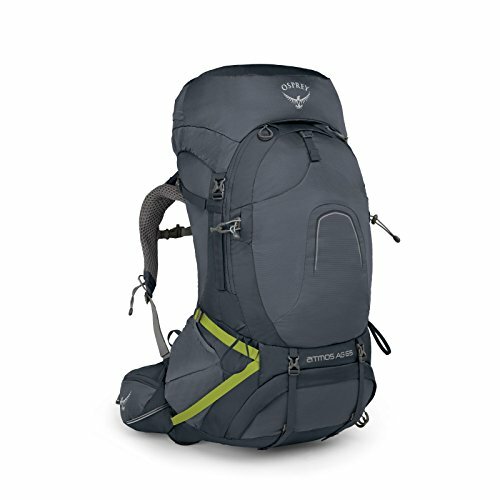 Osprey Aura AG 65 | from $208.55. Osprey Ariel AG 65 | from $239.00. See our in-depth women's Osprey Aura AG 65 vs Ariel AG 65 comparison! Removable raincover is contained inside the upper top lid zippered pocket of both packs. Among tens of backpacks, Atmos AG 65 is single handedly the best backpacking pack we tested. Its design will make you forget that you're even wearing the pack. It can be used for literally any outdoor activity due to its superior suspension performance demonstrated with a variety of loads. Fit-on-the-fly hipbelt provides a secondary lid inside the belt and hence exceptional adjustability for any waist size. Completely adjustable harness provides excellent comfort. Backpanel is incredibly ventilated. Suspension of Aether AG 70 is superior with very heavy weights. Convertible top lid daypack, J-Zip front access to main compartment and larger volume makes very feature rich Aether AG 70 a better option for going on trips of 5+ days, winter trips, trips with kids or very heavy loads. Atmos AG and Aether AG models aren’t “just updates” of Atmos and Aether models (without the AG's), but complete redesigns. We don’t recommend considering the information given in this article to decide for Osprey Atmos vs Aether. There’s something I’d like to clarify in advance. Atmos AG and Aether AG are the names of Osprey’s men’s multifunctional backpacks. Previous models of Atmos AG and Aether AG are named Atmos and Aether, without the AG’s. Osprey AntiGravity (AG) suspension system. Women’s specific counterparts to the Atmos AG and Aether AG Series are Aura AG and Ariel AG respectively. Their fit and sizing are designed to fit a woman’s body. Like Atmos AG and Aether AG, there are previous models of them too: Aura and Ariel, without the AG’s. Different volumes mean different products. Don’t use this information to decide between, for instance, Atmos AG 50 vs Aether AG 60. So, we have 8 backpacks in total. Currently, these packs are only being sold with the AG backsystem, so I’ll talk about them. You can find the previous versions on retailers like Amazon if you prefer them for some reason. AG stands for Anti-Gravity, a suspension system that introduced by Osprey in January 2015. The first pack introduced with this backsystem was Atmos AG Series. This system consists of a mesh foam reaching from top of the backpanel all the way down to the hip belt. It’s intended to provide carrying comfort, effective load distribution and air ventilation by stabilizing the backpack and forming a space between your back and the back of the backpack; and both products fulfill these duties without a hitch. Ultimately, AG system keeps you less sweaty and exhausted along the way along with enhanced comfort. For me, like many backpackers, fit is the most important criteria in terms of harness. Because any mild misfit will feel a lot more uncomfortable at the end of the day. That’s why I recommend prioritizing the right fit and adjustability over other features and reminding it to yourself while reading further. Other than that, overall I’ve found that Atmos AG 65 is more convenient for relatively lighter loads due to its superior adjustability, better backpanel suspension and lighter structure. On the other hand, Aether AG 70 is more convenient for relatively heavier loads due to its robust hip belt, superior overall suspension and convertible top lid daypack. I’ve got to mention one more very important fact before going into detail on each harness element. You need to know that both products squeak fairly especially on the hip belt due to their solid construction. It's tolerable, though. A perfectly silent pack is an undependable pack. Upper portion of Atmos AG 65 straps contain adjustable stiffeners that help with very effective load distribution with seamless fit. Aether AG 70 lacks adjustable stiffeners. With that said, you’re going to love the sturdy, thick, very well-padded straps of both products, they’re some of the best ones in the market with Atmos AG being slightly superior to Aether AG due to adjustability mentioned above. Hip belt fit is very important for efficient load distribution. Osprey followed two different customization approaches with these products. Atmos AG 65 comes with so-called “fit-on-the-fly” hip-belt technology. It’s by far the best fitting hip-belt I’ve ever used. Fit-on-the-fly feature provides an extendable hip-belt that can be elongated for customization by basically pulling the lid inside the hip-belt and adjusting accordingly. Atmos AG 65 hip belt. On the other hand, Osprey introduced IsoForm custom heat moldable hip-belt with its Aether/Ariel AG products. You basically visit an Osprey dealer where an Osprey oven is available. They heat the hip-belt and mold it to your own hip. For online purchases, custom heat molding is serviced in a local CM Certified Dealer anywhere near you. I’m told that remold is possible up to 3 times in case of drastic bodyweight change where custom fit is lost. Honestly, any hip-belt is naturally molded to your body over wearing the pack hundreds of hours. Heating process is just to speed up the foam compression. So Atmos AG 65 is the winner in terms of hip belt adjustability. I think the main overlooked advantage of Aether AG 70 hip-belt is its superior robustness and thickness which is why they perform better when carrying heavy weights. Both products come with excellent organization and versatility. Both products are traditional top-loading designs, but an additional entrance to the main compartment shows up from behind when the removable sleeping bag compartment divider is removed. In addition to these 2 entrances provided by both products, J-Zip provides front access to main compartment in Aether AG 70 so that you don't have to dig all the way to center of the main compartment to access an item there (see below). Atmos AG 65 lacks J-Zip, so there's no front access to the main compartment. The stretchy, extendable kangaroo mesh pouch buckled to front panel in both products is suitable for any wet, smelly or dirty items. Sleeping bag compartment is versatile. It's big enough to fit a bear canister. Even a tent can fit inside when split with a friend, or the removable sleeping bag compartment divider can be removed to expand main compartment and essentially get carried there as a whole. When the floating top lid is removed for lighter use, under that another lid or so-called Osprey’s FlapJacket shows up in both products to cover the top opening (see below). It’s a nice to have for shorter trips. Apart from removing, top lid is also extendable to accept overloading. Aether AG 70 is equipped with convertible top lid daypack in US. You remove the lid, unzip the top pocket, take shoulder straps out to convert the top lid to a legit daypack. Having two compartments and a gear loop it’s large and versatile enough to carry all your daily needs and clearly far better compared to convertible daypacks of other backpacks. Atmos AG 65 and Aether AG 70's being sold outside US come with an integrated detachable raincover inside the top zippered compartment. Make sure drying the raincover after use to avoid mildew. At total, Atmos AG 65 stands at 8 external pockets against Aether AG 70’s 7 external pockets. Hip-belt pockets are very handy for the items you need to get your hands quickly. They’re larger than the size of regular smart phones. 2 front zippered wide pockets in Atmos AG 65 are very wide but a little bit too compressed for bulky items. Atmos AG 65’s top lid has one large and one smaller pocket arranged in horizontal layers on top of one another, while Aether AG 70’s has one zip pocket. There’re two installation options of these pockets, horizontal and vertical. Higher upper installation borders in Aether AG 70 lead to deeper pockets. Vertical installation also serves as a tool attachment when combined with upper side compression strap in Aether AG 70 and both upper and lower side compression straps in Atmos 65 AG. Horizontal installation helps you easily reach the water bottle and reinstall it when you’re wearing the backpack. During reinstallation, normally it’s difficult to access the pocket, widen it sideways and install the bottle. However, upon user requests Osprey added one small loop on each pocket to make it easier to reach and widen the pocket with your finger. Distinctively, Atmos AG 65 has one a little bit too long but useful internal top compression strap located at the entrance of main compartment and Aether AG 70 has 2 front straightjacket compression straps. Like many reviews online I’ve also found traditional front straps of Aether AG 70 to be more effective in terms of stabilizing the load than internal strap of Atmos AG 65. You can evaluate your torso length at home with the help of Osprey’s very own Size & Fit article , then you can find the torso length vs recommended size chart of Osprey under the same article and choose accordingly (click on image to enlarge). Find Atmos AG and Aether AG on 2nd and 3rd rows. I’ve been using both products for over a year now and I didn’t see any sign of wear. Atmos AG 65 and Aether AG 70 are very feature rich packs. An external hydration reservoir sleeve is added to both products. Additionally, there’s an emergency whistle embedded in sternum strap in Atmos AG 65. Following are the tool attachments involved in both products. These loops are used with bungee tie-downs for ice tool carry. Sleeping pad straps are removable. This attachment and loop are used if you don’t want to stash your poles. Atmos AG 65 offers Cinnabar Red, Graphite Grey and Absinthe Green options. Aether AG 70 offers Neptune Blue, Adirondack Green and Outback Orange options. Osprey Atmos AG 65 manual can be found here. Osprey Aether AG 70 manuals can be found here (EU/US). Who should choose Atmos AG 65: If you’re going to be packing for both long and short periods, choose Atmos AG 65.
Who should choose Aether AG 70: If you’re going to be packing for 5+ days 90% of the time, choose Aether AG 70. My personal preference: Overall, I prefer Atmos AG 65 over Aether AG 70. Does this mean I’d NEVER use Aether AG 70? No, I’d still use it for longer trips. Turn your phone sideways for optimal table display!